The psychologists suggest a few reasons why people get things wrong. Firstly, we’re quick to analyse and grade our performance in social situations. If you’re telling a story, you might think you should have gotten to the point quicker or delivered a better punchline. However, the listeners are less fussed; they got the point of the story and thought the punchline was funny enough. Secondly, when people think of having a conversation with a new person, they tend to have very low expectations. They might be thinking, “this is probably going to be a bit crap”. Afterwards, they tend to feel relieved; while you’re beating yourself up over some minor issue or another, the listener is ‘thinking that it could have been much worse’. Thirdly, people are overly focused on their own performance and tend to think others can see just how nervous and self-conscious they are. However, you might feel beads of sweat coming from your armpit, but your audience can’t. The other person isn’t psychic, the researchers note. ‘In people’s minds, they are stammering and nervous and searching for the right words, but others cannot see the inside of their minds’. Even if your voice quivered a little, the other person probably didn’t spot it – they were likely too busy thinking about their own performance to notice. I’m not surprised by the findings. Cognitive behavioural therapy (CBT) research has long shown that socially anxious people, in particular, are prone to mind-reading. All too often, people assume they know what the other person is thinking of them and that it’s bound to be negative (“she thinks I’m useless”, “OMG he thinks I haven’t a clue”, “people see through me”). Social anxiety is marked by an acute self-focus and self-consciousness, so much so that you miss what is actually happening in the room, leading to inaccurate perceptions of what others think of you. Furthermore, if you’re anxious, you’re likely to have a heightened awareness of the physical symptoms of anxiety, but these symptoms are not nearly as obvious to others as they are to you. Besides, what’s so wrong with seeming nervous anyway? Most people know what it’s like to be nervous on social occasions, and don’t think ill of others in the same boat. CBT treatment of social anxiety has long focused on helping people to form more accurate and helpful perceptions of their social performance. 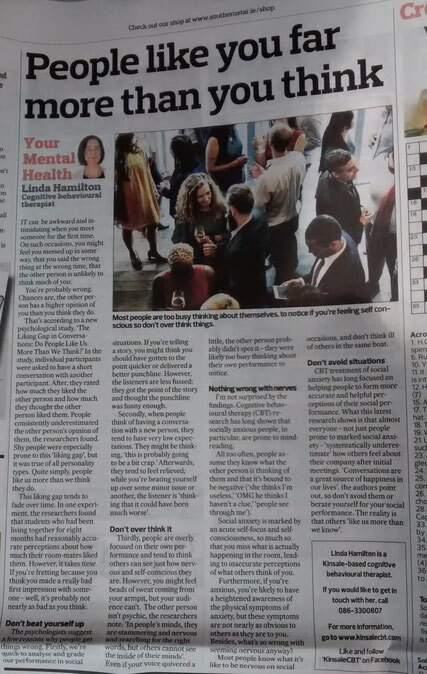 What this latest research shows is that almost everyone – not just people prone to marked social anxiety – ‘systematically underestimate’ how others feel about their company after initial meetings. ‘Conversations are a great source of happiness in our lives’, the authors point out, so don’t avoid them or berate yourself for your social performance. The reality is that others ‘like us more than we know’.